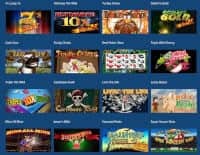 Liberty Slots Casino Review 2019- Get $777 FREE! Visit Liberty Slots Get Your Bonuses! Liberty Slots Casino is powered by WGS Technology, a provider audited regularly. Fully licensed and regulated. Approved by the Government of Curacao. Free deposits processed instantly and securely. ? All legitimate, real-money online casinos like Liberty Slots have strict anti-fraud screens, and that may create a short withdrawal delay. Payouts approved in approximately two business days. You can get three deposit bonuses after you register a new account. No Liberty Slots bonus codes are needed. Just check the bonus box to get 100% up to $259 on each of the first three payments. ? Please read the terms and conditions carefully and make sure to take full advantage of the bonus offer. Are you looking for a reliable online casino? Do you want to play exciting slots on the internet? Will free bonuses make your experience more enjoyable? We have the perfect options for you, presented in detail by CardsChat.com experts. If you are from the United States, the list of trusted options is not that long, however there are definitely good online casinos that have a lot of games and offer free money through bonuses. Liberty Slots fits this description very well and it brings its own style to provide a more familiar environment for Americans. The online casino went live in 2011 with software from WGS Technology. It caters to players from all over the world, offering multiple banking options to make sure that deposits and withdrawals can be made without issues. It also has a great support service where users can get help regarding any casino related query. You can use the live chat function on the site for instant support or opt to use the toll-free phone number to get in touch. Alternatively, clients can also send emails to the support team and a response is normally provided in under 24 hours. Liberty Slots Casino maintains a fairly simple design for the site, with big buttons and a version of the lobby on the main page. It is available by instant play, download and on mobile devices. In addition to the $777 welcome package that is available over three deposits, players can also get other rewards and promotional offers. It only takes a couple of minutes to get started. Register securely on the site right now and choose from over 200 casino games! While some operators opt to use multiple software providers, Liberty Slots remains loyal to just one studio. WGS Technology, formerly known as Vegas Technology, has been in the industry for a very long time and Liberty Slots is the flagship casino powered by this developer. It is also worth noting that WGS is one of the top online providers available in the United States. The updated platform comes with a new lobby with elegant animations that gives users a taste of Las Vegas. WGS Technology has a good selection of games and is more than capable of pleasing customers without help from other developers. While it is mostly known as a slots provider, it also has video poker, table games and specialties in its portfolio. More than that, the software works on different devices and operating systems. You can play the way you like and always enjoy high quality and fast loading times. Overall, the casino gets 7/10 for its software in the Liberty Slots review. Download for free. Click on the download button to get the free application. The small size makes sure that you can quickly get and install the client. Use the icon on the computer desktop to connect and browse the full selection of games. Instant play on the site. Get a no download version of the modern lobby directly on the website. Login to play for free or for real money. Easy access to the cashier and the account allows you to always be in control. Mobile betting on the move. The software is available for Android, Apple iOS and Windows devices and it runs from the internet browser app. The Liberty Slots mobile site will change automatically when visiting from a smartphone or from a tablet device. In order for everything to fit well on a small smartphone screen, the design of the site has been changed a bit. It still keeps the overall design but the branding is minimal. What really matters is the list of optimized games that you can enjoy on just about any mobile phone. The collection exceeds 70 gaming options and includes 3-reel slots, 5-reel slots, video poker and table games. There is even a tournaments tab that allows mobile players to take part in tournaments for selected slots while away from the computer. The buttons at the bottom make sure that users can still get support if needed. The casino promotions remain the same so you can claim deposit bonuses, earn loyalty points and take part in various other promotions once you are signed in. The Liberty Slots Casino mobile app is secure and so banking is supported through the same methods. Some of the most popular mobile slots on the site include Cash Cow, Funky Chicks, Vegas Party and Beat the Bank. You don’t have to install any additional apps if the internet browser application supports Flash, which is the case for most modern devices nowadays. The name would suggest that the casino is all about online slots. However, our findings during the online review for Liberty Slots show that the operator has something for everyone. The list exceeds 220 games in total, although not all of them are available on the site. You will have to access the casino through the downloadable client in order to get the full collection at your fingertips. When playing on the site, the total is of around 190 games, which is a very good amount of gaming options seeing that Liberty Slots Online Casino is only powered by one provider. In both versions of the online casino, the lobby is very welcoming. It keeps the American theme while presenting a real casino feel. Categories on the left allow you to browse the options and try out the ones that catch your attention straight away. Some featured games are displayed at the top and these should definitely be checked out. 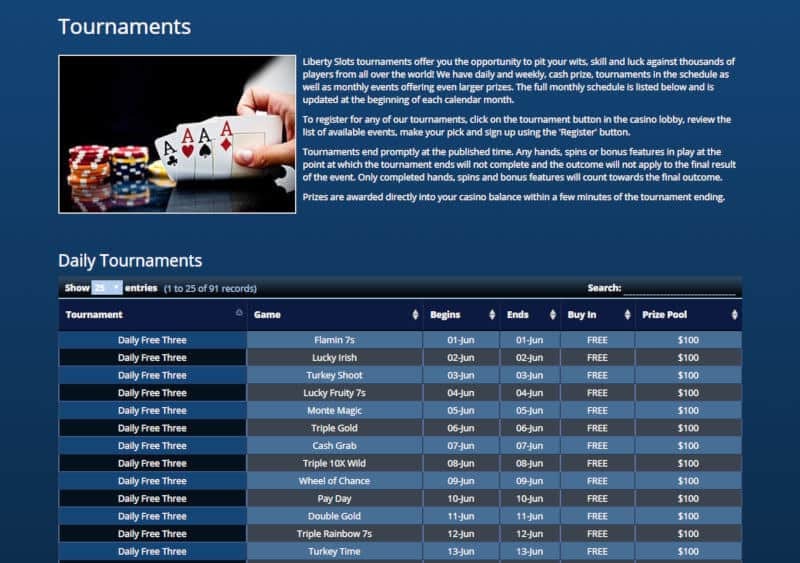 You will also be able to find a tournaments tab that has events for slots, table games and for video poker. While most tournaments cost money to enter, there are also free rolls that have prize pools of up to $800. Most players prefer slots over other casino games. The themes are usually more entertaining and the features can really generate big prizes. The spinning reels are very exciting, especially when bonus games are triggered. You will find a great selection at Liberty Slots. The casino lives up to its name by offering around 100 5-reel slots and more than 50 3-reel slots. There are even a couple of 7-reel slots available, which are very rare online. If you want to try something very different, these options can provide a thrilling experience. For even more suspense however, the big progressive slots have jackpots that are sure to get players excited. The biggest jackpot right now is of over $150,000 and is available in the Mega Money Mine classic slot machine. This 3-reel title has a simple gameplay with only one payline and classic symbols. You can win the massive jackpot in full if you bet three coins and get the three gold mine symbols on the line. Having subcategories for the many slots is definitely a plus since it is a lot easier to locate the right games. There are also preview images when browsing so that you can get a general idea of what the theme looks like before even starting the game. If you don’t know where to begin, we recommend starting with the featured titles and the big progressives. The other games on the site make Liberty Slots a complete online casino. You can find all the popular table games here, including blackjack, roulette, craps, red dog, baccarat, casino hold'em, and pai gow poker. These options have been designed to offer a realistic view, similar to the one you will get in a real casino in Las Vegas. Short animations help in this regard as well since you can see the cards being dealt from the deck and the little wheel spin to determine the winning number. A notable game in this category is progressive blackjack, where the jackpot is won with four aces of the same suit in the hand. The prize is usually over $50,000! Video poker comes in multiple variants. Jacks or better, deuces wild, and bonus poker are among the most popular machines in the category. Multi-hand versions are provided as well for players who want to make the most out of every round and bet on up to 100 hands at the same time. The list is completed with a few specialty games. Most of them are only available on the downloadable casino. Keno has plenty of fans around the world. It is joined at Liberty Slots Casino by bingo, poker dice and poker slots. The simple playing rules and the potential to win huge prizes can make these options appealing. However, the RTP is generally not that good. In order to win money from the casino games, you first need to add playing funds to the account. This can be done through multiple payment options, all of which are safe and secure. For the Liberty Slots Casino review, we tried out the available methods to see how they work and what the availability from different countries is. For American players, deposits can only be made by a handful of options, such as debit cards, credit cards, and Bitcoin. Customers from other countries can also use web wallets and prepaid cards. After depositing through a debit or credit card, players are required to send the proper documentation and bank authorization before withdrawing. Most methods are free but there are some hefty fees of $45 when cashing out by check or by wire transfer. Minimum withdrawals are of $150 while the maximum is between $2,500 and $5,000 per week, depending on the banking option. When browsing the site of an online casino, you will often find bonuses advertised in big letters with flashy animations. These are there to attract the attention of new players and can be of really impressive numbers. However, the terms and conditions are written in much smaller writing and they are not advertised at all. We believe that information is key and that it is extremely important for the picture to be complete and for everything to be clear. This is why, when we are talking about the Liberty Slots bonuses and promotions, we also talk about the wagering requirements and other notable conditions. Minimum deposit to qualify for a bonus is of $5. Not all games have the same contribution rates for the wagering requirements. Slots are at 100% while table games and video poker only count 10%. Available only for the first deposit done using a web wallet. Does not require a bonus code but players must select the promotional box in the cashier. The playthrough requirement is actually lower than what you will find at most online casinos, making the Liberty Slots Casino bonus easier to clear. However, it is good to point out that it is really only usable on slots since the other games have much lower contribution rates. Having to bet $400,000 on blackjack to clear a $100 deposit plus the bonus is not feasible. The best approach would be to make a standard deposit and claim the bonus that you can actually use to your benefit. The doubled bankroll can mean twice the fun if used correctly. This unique loyalty program uses comp points to keep track of customer activity. As soon as you deposit $25 or more, you are entered at Amber level. When you bet, you receive points, which in turn help you increase the rewards level. Each of the six tiers comes with its series of benefits, including bonuses on all deposits and specials throughout the week. Reload offers on specific days of the week are part of the rewards program. The actual figures go up as you advance from Amber to Bronze, Silver, Gold, Platinum and finally to Diamond. At the highest level, you get 35% extra on all deposits, a 100% deposit bonus on the first purchase of every Friday, up to $250, 75% up to $250 on every Monday, 50% up to $500 on every Wednesday, and 75% up to $150 on every Saturday and Sunday. The comp points we mentioned previously are issued for wagers on all games. The rates depend on the current level you have in the loyalty program and on the games you play. For slots at Amber, you receive 160 comp points for every $100 in wagers. At the same level and wagered amount, you get 30 points for blackjack. Big jumps are available for every new tier, up to 256 points for $100 on slots for Diamond members. Once you have 1,000 points accumulated in the account, you can use them to buy $1 in bonus funds from the cashier. Featured games generate double comp points every month. Registered customers have access to the weekly email newsletter, which contains exclusive offers and various invitations for promotions. The email usually goes out on Friday, so make sure to keep an eye out for the Liberty Slots Online Casino list of goodies. Visit Liberty Slots Get Your $777 Bonuses! 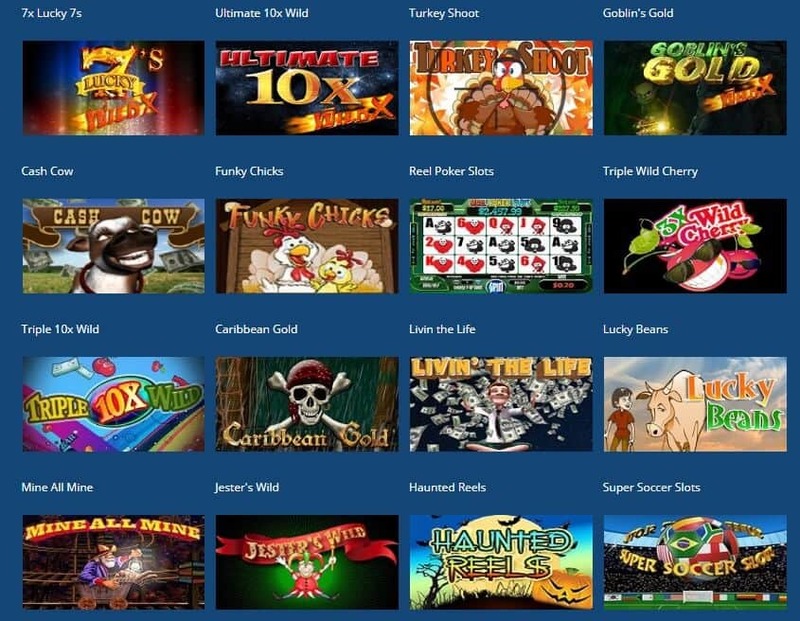 Join Liberty Slots and get started with 100% free, up to $100!